이 포스팅은 한국/일본의 정보제공자 및 협력에 의해 작성된 내용이며, 그 분들의 도움/노고에 감사를 표합니다. 이 포스팅에서는 코나미사의 Beatmania IIDX 의 녹화/방송에 관해 알아보겠습니다. 현재 최신작은 2018년 1월 기준 25 CANNON BALLERS로 20 Tricoro 부터 1280x720 60Hz의 HD모드를 지원하기 시작했으며, SD모드로는 한국내 해당사항이 없으니 HD모드 기준으로 이야기를 하겠습니다. 이 글은 RGB 컬러 입력만을 언급하며, 컴포넌트로 변환된 신호의 캡쳐는 언급하지 않습니다. 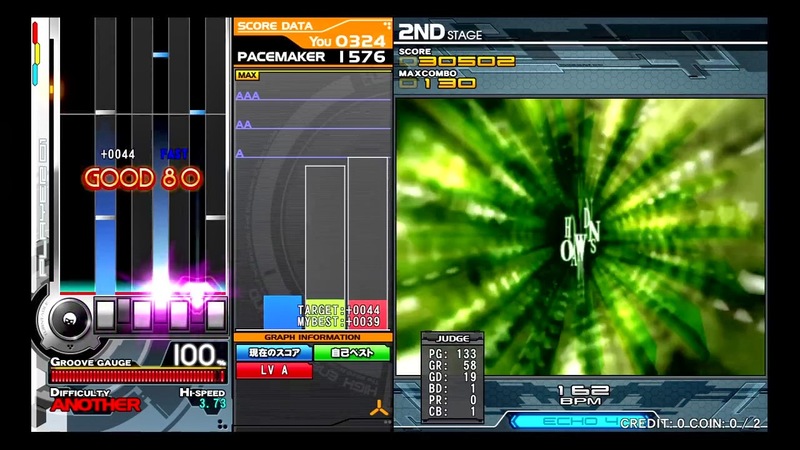 - IIDX 25 Cannon Ballers 부터 기판변경으로 DVI 출력1 만 사용가능. - 반드시 분배기 필요 하며, DDC/CI 및 EDID 패쓰쓰루 기능이 있는 것을 강력권장. - DVI-D 출력1 : 모니터용. DVI/HDMI 분배기를 써서 분배해야 합니다. - DVI-D 출력2 : 사용불가. 기판 업그레이드 이후 DVI2 출력 사용불가로 인하여 아래 그림과 같이 case 1 방법은 더이상 사용할 수 없습니다. 아래 사진은 기판 출력부 모습니다. The Indoor Game (ザ・インドアゲーム) 사진제공. 이 자리를 빌어 감사드립니다. 취소선이 그어진 밑의 사양은 IIDX 20 Tricoro 부터 24 Sinobuz를 언급하고 있습니다. - 국내 정식발매 기준이며, 사실 기존 구기계로도 케이블만 연결하면 문제없이 캡쳐할 수 있습니다. - 구 기계의 경우 DSUB/DVI 분배기를 사용해야할 가능성이 있으며, 이에따른 시행착오는 여기서 언급하지 않습니다. - 2차출하분에 모니터가 1차분의 LG모니터와 다른 종류이지만 그에 따른 본 내용에 차이는 없습니다. Case A : 녹화기 또는 PC가 분배된 영상과 음성을 직접 받는 경우입니다. Case B : 녹화기가 입력을 받기 전에 영상과 음성을 합쳐놓은 신호를 받는 경우입니다. PC로 캡쳐하면 Case A에 해당하며, 컴퓨터가 영상과 음성을 알아서 합성해줍니다. 녹화기의 경우 HDMI과 음성을 각각 합성하여 주는 기능의 유무에 따라 A와 B로 나뉩니다. 밑에서 해당 장비를 설명하겠지만 예를들어 에버미디어 녹화기들은 HDMI영상입력+별도 음성입력시 합성 기능이 내장되어 Case A에 해당합니다. 반면 업장에서 자주 사용하는 AP-Active-HD는 컴포넌트가 아닌 HDMI로 입력하기 전에 미리 영상과 음성을 합성해야 하기에 Case B에 해당합니다. Case B의 경우 녹화기(10만원선)와 AV muxer(5~10만원선)를 구입하는데 드는 비용이 Case A에 대응할 수 있는 녹화기(15~20만원선)과 같으므로 상황에 맞춰 도입하길 바랍니다. 크게 2가지 방법이 있습니다. 하나는 기판의 모니터출력 1/2를 각각 기계모니터/캡쳐보드에 연결하는 방법과, 다른 방법은 모니터출력 1만 사용하여 DVI 또는 HDMI분배기를 사용하여 나오는 분배신호를 각각의 기기에 물려주는 방법입니다. 소개는 전자 후자 순서로 소개하며, 각각의 장단점이 있습니다. 전자의 경우, 쉽게 상시설치 후 관리가 편하지만, 기판PC의 상태에 따라 미세한 렉/싱크어긋남/판정위치의 미세한변화 등의 문제점이 발생할 수도 있기에 검증이 필요합니다. 출력신호가 원래 1개인 게임을 두 개로 동시에 쏘다보니 게임사양에만 최적화되어있는 기판PC에 예상하지 못한 과부하가 걸릴 수도 있습니다. 후자의 경우, 상시설치 후에 관리가 까다롭지만 기판 PC에 부담을 비교적 덜 주어 미세한 렉/싱크어긋남/판정위치 문제가 일어날 가능성이 전자에 비해 확률이 낮습니다. 그렇다고 싱크어긋남이 없다고는 할 수 없으니 유의하기 바랍니다. 후자는 DVI/HDMI 디지털 신호의 경우 기판의 그래픽칩과 모니터 또는 캡쳐보드 사이에서 EDID/DDC의 신호교환이 제대로 안되는 문제 등으로 화면표시에 문제가 발생할 수 있으므로, 관리를 하지 않을 경우 어느날은 캡쳐가 안된다던지 문제가 발생할 여지가 있으며, 싸구려 분배기보다는 20만원 정도의 AV급 고급분배기 등에 있는 EDID/DDC정보 내장기능이 있는 것을 선택하는 것이 신뢰성을 높일 수 있습니다. 사례 : Avermedia Live Gamer Portable을 사용, 소수 유저로부터 판정이 간혹 이상하다고 클레임이 발생, 철거됨. 3a. 캡쳐장비 : 밑의 리스트에서 한 개 골라서 씁니다. 적색으로 표시된 장치는 추후 차기작에서 더 높은 해상도 (1080p60) 변경으로 녹화할 수 없을 가능성도 있습니다. - GPU : 필요없음. CPU내부 그래픽칩이 없을 경우에만 장착해도 무방. 반드시 분배기를 사용해야 방송/녹화할 수 있습니다. 2014년 6월5일 추가 : CPU가 i5 -2xxx 또는 그 이상일 경우, 충분한 사양으로 가지고 있으므로 QSV를 굳이 사용할 필요가 없습니다. 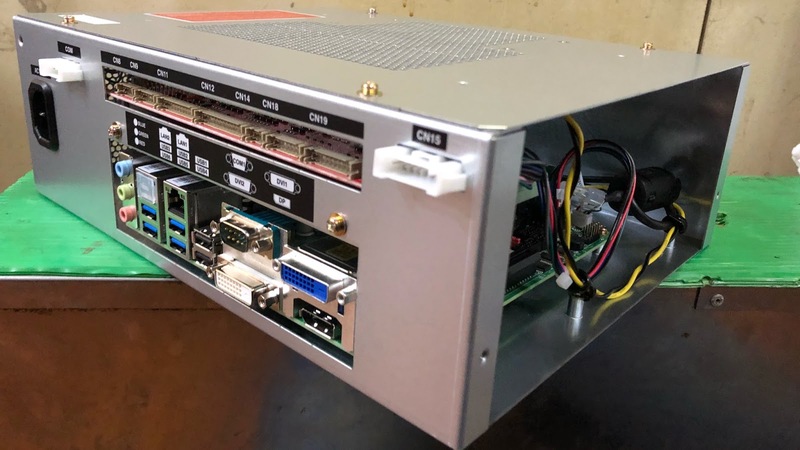 CPU만으로는 실시간 인코딩 능력이 부족하여 60프레임이 나오지 않는 경우에 한해서 사용해 주십시요. 2015년 6월 25일 추가 : 고품질 압축사용시 최근 버전은 약간 인코딩의 내부 옵션이 변경되어 이 포스팅의 작성당시보다 사양을 더욱 요구하게 되었습니다. i3-4xxx급도 약간 힘겨워하는 정도이며, i5-3xxx/i7-2xxx 또는 i5-4xxx일 경우에만 체크를 권장합니다. 이 옵션의 원리는 영상을 더욱 더 압축하여 정해진 방송 대역폭내에서 보다 높은 화질을 구현할 수 있습니다. 하지만 차이는 적당히 미미한 수준이라서 체크/미체크 크게 신경쓸 필요는 없습니다. 과거 포스팅 내용 중 필요한 부분을 복사해 왔으며, CPU에 따라 다음과 같이 녹화해야 합니다. - Core i3 2xxx, 3xxx 통칭 "Sandy Bridge / Ivy Bridge"
줘야합니다. 하지만 i5-2xxx 부터는 전부 CPU로 처리해도 충분하며, i3-4130는 어느쪽으로 설정하여도 2중 인코딩 720p60를 걸어도 충분합니다. GPU가속보다는 CPU처리가 보통 화질이 조금 더 우수하므로 CPU측으로 설정합니다. Raw화면에 준하는 영상을 얻기 위해서는 동영상 캡쳐(Alt+C)로 코덱 H.264에 비트레이트 10000kbps 정도로 녹화할 필요가 있습니다. 8000kbps로 송출중이라면 스트림저장을 강력히 추천합니다. 모니터에 따라 외곽에 레터박스가 생기는 경우가 있습니다. 이럴 경우 IIDX의 디스플레이 설정을 HD, HD* 둘 중 하나로 바꿔보시면 꽉 찬 화면으로 표시되게끔 변경하면 됩니다. 공장출하 기본설정은 일본기준 HD*로 맞추어져 있으므로 각 업장 모니터에 따라 설정 변경해야 합니다. 예전에 이 문제로 언급했었지만 HD* 설정이 생긴 뒤로 EDID 에뮬레이터는 이제 필요 없습니다. - 분배기 사용/미사용 어느쪽이든 디지털 신호는 원인불명의 스케일링 현상 발생. - 캡쳐보드 입력신호 DVI/HDMI 어느쪽이든 디지털 신호는 원인불명의 스케일링 현상 발생. 이 문제는 일본모니터 및 한국 1차모니터에서 일어나는 현상이며, 2차모니터로 추정되는 몇몇 업장에서는 이런 현상이 없을 수 있습니다. 예 : 한국 IIDX 1차모니터(LG수출용 42") 사양. 예 : 한국 IIDX 1차모니터(LG수출용 42") 사양, 캡쳐영상. Q1. 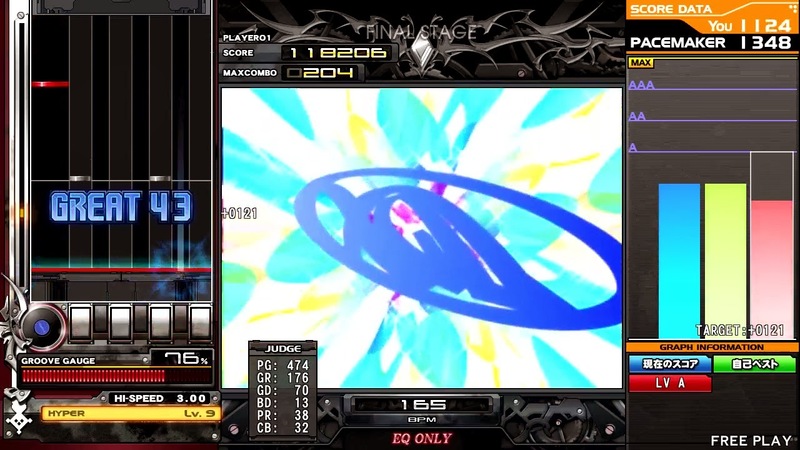 이하의 사양으로 IIDX 녹화를 했는데, 끊김이 발생하였다. 보고 판단해주길 원한다. 녹화 후 편집하여 레터박스를 삭제했지만 끊김은 남아있다. - 우선 레터박스를 지우는 과정인 "재인코딩"된 상황에서 판단하기 어려우므로, 장비에서 처음 받아낸 원본파일을 봐야 알 수 있다. 편집하지 않은 원본을 첨부해달라. - CPU가 i7 이면 사양이 넘쳐나서 GPU가속인 QSV를 굳이 사용안해도 충분하다. PC의 설정/사양 문제일 가능성이 있으니 체크하라. A2. 이 캡쳐보드는 PC 전용 VESA 해상도를 지원하지 않는 장비로 부팅화면에서 해상도가 전환되는 시점에서 1280x720으로 전환되지 못하여, 게임부팅이 진행안되는 에러가 발생합니다. 이를 해결하기 위해서는 단순 분배기가 아닌 EDID/DDC 정보를 복제 또는 패스스루가 가능한 분배기가 반드시 필요합니다. 해당 업장에서는 4만원 선의 HDMI분배기를 새로 구입하여 문제를 해결하였습니다. 이 장비는 2018년 1월시점 매우 오래된 장비이므로 지금 도입은 추후를 위해 권장하지 않습니다. 국내에 보급된 spada (구) tricoro 기체 PCB의 사양은 시중에 널리 보급화 된 코어2듀오급 입니다. 할 정도의 프레임 하락도 종종 눈에 띄는데 캡쳐장비가 아무리 사양이 좋다 하더래도 결국 위 영상과 같은 현상이 나타날수 밖에 없는 것입니다. 말씀하신대로 게임 하나 돌리는데만 최적화된 사양이라, 순수 게임중에도 조금이라도 부하가 걸리는 상황에서는 끊김이 발생할 여지가 분명히 있습니다. 본 글의 요지는 "나오는 신호를 캡쳐장비가 잡아주기만 하는 역할"에 대한 글이며, 비록 끊김현상이 나타날 수도 있지만 "기판의 영상신호는 100% 잘 나온다 가정하에 신호대역을 충분히 받아내는 캡쳐장비"를 사용하는 것에 초점이 맞추어져 있습니다. 추가로, DVI-2 출력포트를 이용할 경우에는 녹화피시의 주파수 설정에 주목할 필요가 있습니다. 대부분 비트매니아 기체의 경우 모니터 체크값이 60.000x. 여기에 녹화세팅 59.xx을 하는경우 듀얼dvi 특성상 어느 한쪽이 낮은 값으로 잡히면 나머지도 낮은 값으로 주파수가 떨어지므로 가뜩이나 성능도 안 좋은 PCB에 설상가상 주파수까지 떨어져버리니 간헐적인 렉과 싱크밀림이 생기는건 당연한 겁니다. 성능문제와 리프레시율 변화의 문제는 독립적 두 가지 경우로 구분해야 좋습니다. 2중 출력으로 인한 부하는 성능으로 인한 문제, 60이 59.9xx로 변하는 것은 티어링 문제가 발생합니다. 표시되어도 실제는 59.940Hz로서 받습니다. TV및 AV방송 표준이 이걸 씁니다. 바뀌어 티어링이 일어나는 건 성능과는 별개의 문제임을 분명히 나눠야 합니다. 지적하신대로 캡쳐보드가 60.01를 정확히 지원한다면 아마 해결될 수 있을지도 모르겠습니다. 시스템 자체 볼륨을 높이고 앰프 증폭률은 낮춰서 서로 밸런스를 맞출 수는 없나요? 연결구성을 어찌하셨는지는 모르겠는데, IIDX 시스템볼륨은 건드릴 필요가 없고 건드릴 수도 없습니다. 엠프는 기계스피커 소리를 조절하기 위해서 사용되기 때문에 녹화와는 관계 없어야 정상이고요. IIDX시스템의 3.5파이 스테레오 출력을 분배해서 캡쳐측 장비로 음성신호를 받으면서 Line-in 볼륨 조절하시면 됩니다. 말씀만 봐서는 뭔가 이상한데요..두 가지 중 하나의 원인으로 보여집니다. 엠프측에서 소리를 따왔거나, 녹화컴퓨터측 line-in볼륨 조절에 문제가 있는 것 같습니다. Line in 볼륨을 따로 조정을 해야되나보군요...ㅜ 오늘 오전에 가서 한번 작업 해봐야겠습니다! 이 상황 역시 이어폰 잭에 앰프를 연결해주는 방법 말고는 없는건가요?! 기계 엠프의 라인출력을 뽑아서 해도 좋지만 그래도 마지막단에 헤드폰엠프를 따로 달아줘야 합니다. 이유는 헤드폰의 임피던스가 기계 스피커(8옴)에 비해 높아서 스피커용 엠프에서 억지로 꼽아쓰면 소리 작게 들립니다. Sorry but I'm from thailand and we just got brand new IIDX Machine here, so I'm always interesting in capture and broadcast the game. I want my capture systems to be compact. Because it's quite hard to talk with arcade owner here. So the question.. it's possible to use notebook with some Portable Capture (maybe C875) and connected with DVI-2 >> EDID Simulator >> (maybe DVItoHDMI cable) >> Capture Device? (without any dvi or hdmi spiltter). I'm heard that if I use DVI-2 port on the back of machine, it will occur some lag. Just forgot to tell you. The machine here is the same as Korean version. 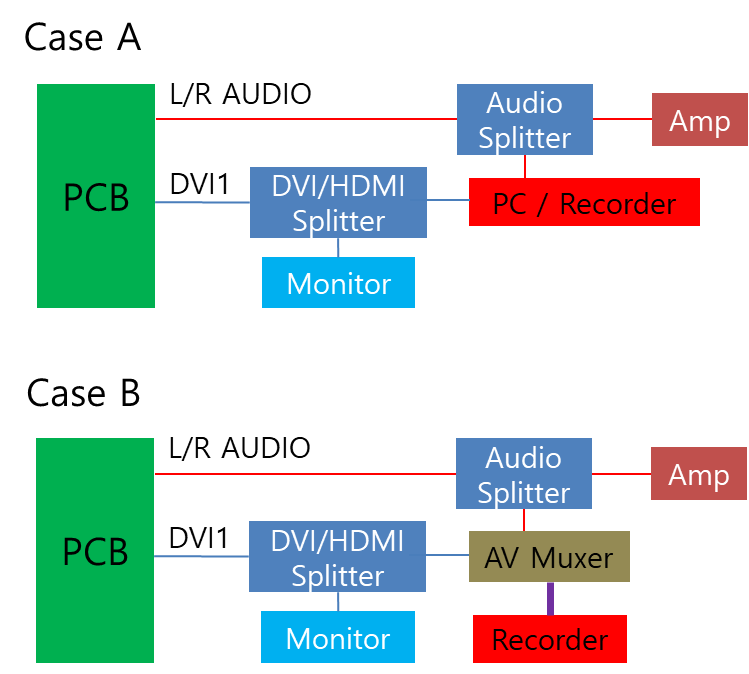 sorry for another question : can I use hdmi spiltter for capture? According to your situation, tt seems to be strict owner in there, you would be hard to support from him. It should be go to portable system. The C875 is good choice, other devices which support both 720p, 640x480 you can use it. One report I received last time that one man used Avermedia C027(actually this pcie card is for fixed system) is not support VESA 640x480 resolution with HDMI splitter (no support EDID/DDC passthough), it was trouble when the game is booting progress. The problem is that C027 has not support VESA resolution, you should to check either capture device support VESA resolution or HDMI splitter has EDID/DDC passthrough(or store) function. See the detail this page about "ERROR" screen. Anyway, C875 should be no problem, means that if you have C875 then you don't need worry about HDMI splitter EDID/DDC functionality. The capture device has not support VESA resolution, then you should to use splitter with EDID/DDC passthrough/storing functionally, just for ~$40. You cannot use DVI2 if you are concerning about portable system due to your situation. DVI2 port should be connect to capture device before the machine power's up or signal would not be out. To summarize, you MUST use splliter. Any cheap one you can use. Just check the EDID/DDC functional. Then fix the splitter nearby machine, connected from DVI1 to splitter input and splitter output1 to machine monitor, just connect splitter output2 to capture device. I think there's no need to concern about EDID/DDC emulator, Just change display mode from HD to HD* in dip switch setting. Some reports I've received about new display mode HD*. It has no-letter box ,due to over-underscan problem by AV standard, it would be captured as perfect pixel matching. This mode has released just few month ago without notice. I wish to my reply would be help you. Be careful that DON'T CONNECT THE CABLE WHEN THE PEOPLE IS PLAYING. Check the english page if you can't well-translated korean page. I have more understand about the systems. Just have to make sure before purchase anything. I just know about HD*. Just curious that it have to change in game setting or back of the machine? p.s. I actually working on installing headphone amplifier too. Don't know why, but the speaker is very bad sound. 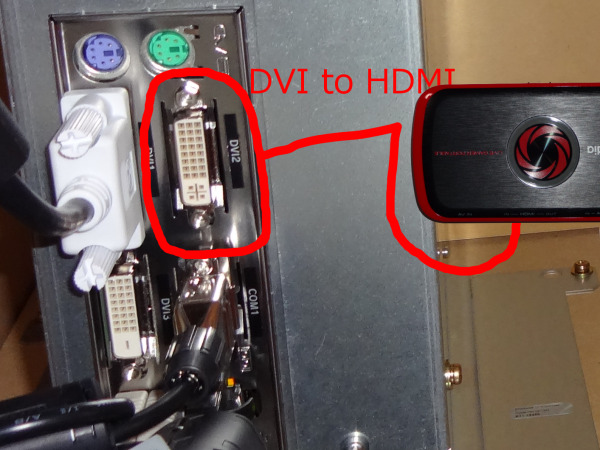 (plus) and if I use "HD*" mode, so that I don't have to worry about EDID/DDC on hdmi splitter right? Your connection scheme is right. Fix it nearby machine's monitor or any nearby back place then you can just connect HDMI output 2 anytime except people is now playing. The display mode HD* cannot be change in game, this is actually for machine's game setting not for player's option. Open the front door of machine and push setting button (maybe the red or some color square button in there, forgot the color) and change display mode. I can't guarantee about really no more need EDID/DDC splitter because I have no experience of that mode, my work was over 2years ago. But according to some reports, yes, it should be ok. Purchase reasonable price one($30~50) not too cheap and expensive. Or, just rent from your friend who already have splitter and test it. Since both side speakers of korean machine are poor quality, it need to change to other one (Impedance 8ohm) or pain terrible sound in playing. If L/R RCA jack external lineout of machine's amplifier output in there, it should be connect from that machine's amp output to headphone amplifer input (also RCA jack). I already test capture, it's got a problem when I use HDMI splitter, IIDX machine will boot with weird black border on screen. So I decided to use DVI-2 > HDMI to record that day instead. Maybe it's my splitter problem? But I checked and it's support EDID/DDC. And I'm going to tell you that HD* mode is not good with Korean machine version, it's just cause a bad judge timing. I think it's use for new 42" panel monitor in japanese machine version only. I use google translate to read your HD* issue in this page, and I changed my mind. I think I have going to test it again, maybe it's just need some timing +- adjustment. I wish to know what exactly monitor are thiland IIDX using now. If there is LG monitor and now the display has been over-scanned, which means display has zoomed, then you MUST set the display mode from "Cinema" to "default" in monitor OSD that should be changed from over-scanned to under-scanned (black border). I'm not mentioned about capture, don't confuse. 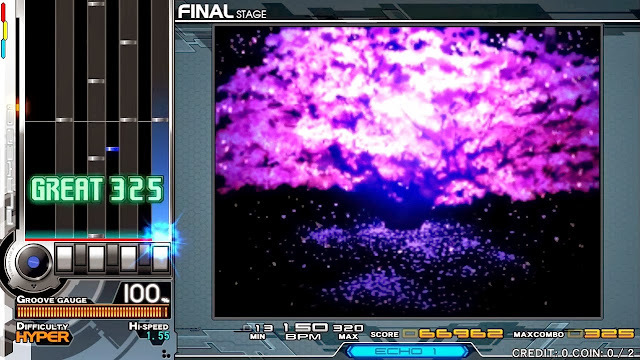 Then you should to change IIDX display mode as HD to HD*, and capture with splitter. About the judge timing, you're right, timing is quite different between HD and HD*, you should set own judge timing in custom option in gaming. If there's other monitor in thiland IIDX instead of LG's, never mind of above mention.. If you succeed live streaming in twitch/youtube or any other platform, let me know link, I wish to watch that. Hi, I didn't reply you because of I'm quite busy last week. and this is latest capture that I've done. 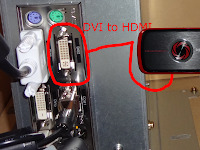 I found yesterday that I can connect DVI2 to HDMI without restart the machine. So it's easy to capture now. I planned to do with other music game too. EDID 에뮬레이터라고 하셨는데, 그것을 사용하면 스케일링 현상을 해결할 수 있다고 하셔서 제가 구입해볼 예정입니다. 어떤 것을 구입하면 되는지, 어떻게 사용해야 하는지 궁금합니다. 답변에서 틀린 부분이 있었기에 지우고 다시 답변드립니다. 케이스 A에 해당하는 제품들은 음성합성할 필요없이 기기 자체에서 HDMI와 별도 음성입력이 가능합니다. 케이스 B의 제품들이 합성이 별도로 필요하니 미국 아마존 등에서 StarTech사의DVI2HDMIA 또는 국내에서 구할 수 있는 비슷한 제품 구하시면 될 것 같습니다. 방송 PC사양 및 녹화기 선정 관련 질문드립니다. 우선 방송 PC사양이 i3-6세대로 표기하셨는데 이와 성능이 비슷한 i5-2500을 사용해도 OBS 사용에 지장이 없는지요. 아니면 다른 프로그램을 알아보는게 더 나을까요? 기억이 오래됐고 당시의 OBS와 지금의 OBS 구조가 많이 달라져서 불확실한 면이 많아져서 확답은 힘들어졌습니다만, 적어도 인코딩은 괜찮았었습니다. 혹여나 i5-2500으로 프리뷰화면은 괜찮은데 인코딩 시작하니 끊기면 인코딩을 QSV로 전환하면 문제없이 될 겁니다. 기존에 쓰고 있던 녹화시스템은 그대로 사용하셔도 무방하니 정말 안되겠다 싶을 때에만 교체를 고려하세요. YK918H은 써본 적이 없어서 확답은 못하지만, 다른 유튜브 영상들을 봤을 때 문제 없을 것으로 생각됩니다. 하지만 그 장비가 위 글에서 언급하는 케이스A와 B중 어느쪽인지는 저도 알 수가 없으니 혹시 사용중이시라면 제보 주시면 감사합니다. 답변 감사드립니다. 덕분에 녹화기 설치는 완료되었는데 몇가지 삽질을 하다보니 정보공유를 위해 댓글로 남기고 갑니다. 우선 제가 일하는 게임장에서는 처음에 YK928H를 사용하려 했으나 이 모델이 아마존하고 알리익스프레스에서 없어지면서 1080P 60FPS 영상을 720P 60FPS로 저장해주는 기능을 가진 대체할 모델을 찾다가 EZCAP 284 모델을 찾게 되어서 그 모델로 설치했습니다. 이때 한동안은 이어폰앰프와 녹화기의 Mic in포트 간 연결해서 임시로 사용을 하게 되었습니다. (원래 이렇게 사용하면 노이즈가 크게 발생합니다.) 이후 DVI+Audio to HDMI를 구해서 장착하였는데도 제대로 된 사운드 인식을 하지 못해서 결국 YK928H를 구해서 현재는 정상 가동중입니다. 말이 좀 길어졌는데 작성하신 글의 케이스는 EZCAP 284 / YK918H&928H 모두 Case B입니다. 다만 YK928H는 한가지 더 특이사항이 있는데 마이크로 USB단자 하나가 있어서 PC에 연결하고 동봉된 CD의 드라이버 설치 및 동봉 프로그램 정품인증만 잠깐 수고해주면 PC에서 녹화 및 방송도 가능합니다. 결국 케이스 A와 B를 모두 충족하는 모델이게 됩니다. 이걸 목적으로 제가 구입하게 되었으며 이를 기반으로 게임 스트리밍 관련 정책을 본사에도 건의할 예정입니다. 참고를 위해 샘플 동영상 및 스냅샷을 링크로 남겨드립니다. 한가지 추신하자면 EZCAP 284도 이론적으로는 CASE A와 B를 충족하는 모델이긴 하나 이를 위해 예전에 YK918H를 기증해주신 분에게 PS4 스트리밍 등 PC연결 스트리밍을 의뢰했는데 드라이버 설치가 매우 복잡하고 이마저도 설치할 경우 480P 30FPS로 방송할 수 있으며 상황에 따라서는 소리도 제대로 안나오는 경우가 발생합니다. 워낙 문제가 있었던지 최근에도 EZCAP에서 펌웨어를 배포했고 최신 펌웨어 설치 후 DVI+Audio to HDMI를 통해 연결해서 소리까지 첨부됨을 확인하였으나 영상 화질 문제와 간혈적으로 소리 녹음이 안되는 등 신뢰성이 높지 않어서 결국 폐기하였습니다. 기타도라는 직접 해본 적이 없어서 확실한 답변은 드릴 수 없습니다만, 1080p에서는 정상이고 720p에서는 위로 1px이 틀어지는 건 장비와 기판의 상성문제라고밖에는 드릴 말씀이 없습니다. 하드웨어인코딩 방식 장비로는 도리없고 컴퓨터로 H-PLL, V-PLL 조정으로 캡쳐위치를 조정하지 않는이상 어쩔 수 없다고 봅니다. Hi, I'm from bangkok. Maybe I ever ask u a question 2-3 years ago. Normally I used to recorded via DVI 2 and CB come. I try to use my HDMI splitter (which has a EDID function) but end up that 2nd output was BLACK screen. But the strange thing is when machine boot (on windows 7 page -1080p) my recorder can capture it. Do you have some idea of what happened? I plan to try buying new splitter. Long time to see you. I see who you are and have an issue from your twitter account. 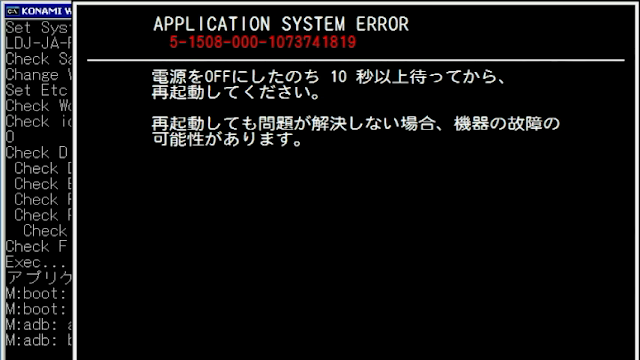 That's the exactly same issue during capturing the pop'n music HD in 5years ago by myself. Obviously I have no experience of C875, only reported information. But I can say that you should to check the setting of capture frame rate. Try all frame rate you can choose, YUY 1280x720p 59.94Hz / 59.9999Hz / 60Hz. The DVI-D or HDMI signal must be set exactly same frame rate with source frame rate. I wish if you succeed the capture, let me know your frame rate setting. The IIDX25 should be captured, some other game center has already recorded. But I have some new problem. Seem like when I plug recorder (I normally don't leave recorder at arcade center) and Monitor will reset to 1920x1080 and can't go back to the game. It's stuck on the win 7 green desktop, so I have to restart the machine everytime. Maybe EDID emulator will help this? Good news! But make sure that the output port for monitor must be used from output1. This port is generally used for DDC communication between source and monitor. Therefore, you should connect the recorder to output2 port. If there is no changed, it seems to be needed the EDID emulator as you thought. Put it between PCB and splitter input, then fix it the resolution as 1280x720p60. 그 외에 탑재된 장치의 사양이 정확히 무엇인가요? 저도 모릅니다. 자세한 건 유니아나 또는 코나미에 문의해보시는 게 좋을 것 같습니다. 온보드 그래픽(메인보드에 따로 그래픽칩을 내장)일 것 같네요. 안녕하세요. 최근 IIDX 기기에 AP-Active CAP을 Case B의 방법으로 연결해 녹화해봤습니다만 영상과 음성의 싱크가 맞지 않습니다. 정확히는 영상보다 소리가 느리게 나와 그 차이가 점점 벌어집니다. 혹시 어디가 원인인지 알 수 있을까요? 원인이 너무 다양해서 특정지을 수 없습니다. 제품불량, 사용하는 USB메모리와 상성, 분배기 또는 HDMI와 음성muxer의 리프레시율이 60Hz미지원으로 영상과 음성의 타이밍불일치 등 직접 하나하나 원인을 제거해나가셔야 합니다.